Need role models for how not to act old? 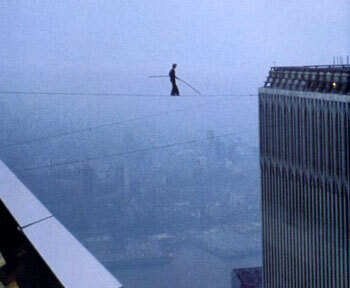 Two great ones whose biopics are playing in theatres right now: highwire artist Philippe Petit and rocker Patti Smith. If you want to feel inspired and energized by an individual’s undiminished drive and excitement about life, gallop don’t stroll to see Man on Wire, the story of Philippe Petit’s walk on a highwire strung between the two towers of the World Trade Center. The drama of the walk itself, nearly 35 years ago, is amazingly vivid even though you know from the outset that a) it’s successful and b) Petit survives. But what’s really galvanizing, in both the historic footage and the contemporary interviews, is Petit’s energy and focus, along with that of his partners in daring. By the end of the film, I was crying, my 25-year-old daughter was crying, and all the retirees in the theatre with us for the Friday matinee were crying too. I haven’t yet seen Dream of Life, the documentary about Patti Smith, but one of my favorite songs for car dancing is her rendition of Bob Dylan’s Changing of the Guards. Here’s a not-very-good video, but the version on her great CD Twelve is infinitely more rousing.